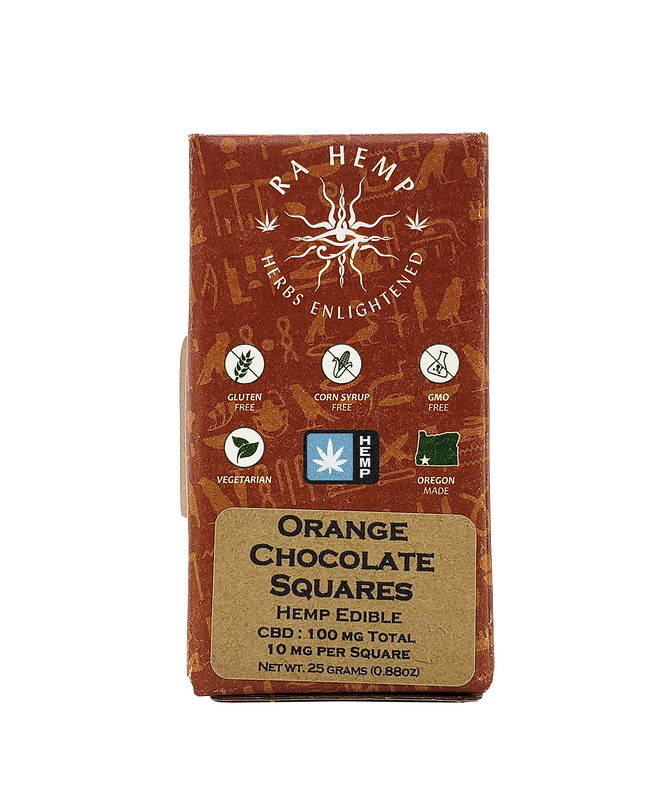 Satisfy your sweet cravings with these infused milk chocolate squares, available in orange and peppermint flavors! 10 pieces of velvety milk chocolate made with the highest quality, ethically traded ingredients, with a delectable flavor of a high-end Belgian chocolate. Formulated for 100mg of Cannabinoid-Rich Hemp. Infused with whole flower oil and pure essential oils. Contains no hydrogenated oils and is egg free and gluten free. Proudly made in America and responsibly sourced, with no slavery or child labor used in farming or production of ingredients. Ingredients: Milk chocolate (sugar, vegetable oils (palm kernel, palm), non-fat milk, cocoa (processed with alkali), whole milk, sunflower lecithin (an emulsifier) vanilla), hemp concentrate, orange or peppermint essential oil. Contains milk. See test results for specific batch information. ​Mythology: The Egyptian God, Ra, was the original Sun God. He was known as the giver of life! Medicinal Herb Lovers: Ask your local health food or grocery store about Sun God Meds! OMMP Patients & Adults 21+: Ask your local Oregon cannabis retailer about Sun God Meds! WARNING: Cannabis is for use by adults over 21 and medical patients in the Oregon Medical Marijuana Program. Do Not Operate a Vehicle or Machinery Under the Influence of Cannabis. Keep Out of Reach of Children.